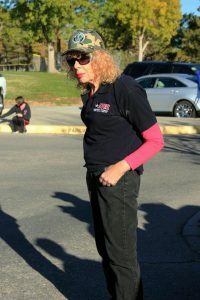 President of her local Veterans for Equal Rights chapter, she proudly marches each year in the Albuquerque Veterans Day Parade. And she volunteers with her local transgender center, particularly with transgender youth, who she sees as fortunately having more options open to them than she did as a child. Whether building model airplanes as a kid – “If something wasn’t working, I’d just keep at it until they’d fly,” says the 75-year-old army veteran – fighting, with her local chapter of Veterans for Equal Rights, for an end to Don’t Ask Don’t Tell, or pursuing every possible avenue to challenge Medicare’s denial of coverage for her health care, she refuses to give up. That refusal has paid off. Denee was finally able to have gender affirmation surgery this past October – the first person to have her surgery covered by Medicare – after a nearly 60-year wait. After all the waiting and effort, the procedure and recovery were the easy part for Denee, who now describes feeling a sense of wholeness and completeness for the first time. But Denee’s successful challenge to Medicare will have an impact far beyond her. The agency’s announcement earlier this year that it would eliminate its categorical exclusion of transition-related surgery from coverage is a significant advancement in health care access for transgender people. Denee first sought coverage in 2012, and was denied. With “a loose-leaf binder full of research,” and the assistance of her private counsel Mary Lou Boelcke, she appealed that denial at every level within the Centers for Medicare and Medicaid Services (CMS). When Denee and Mary Lou hit the end of the line, they reached out to GLAD, the American Civil Liberties Union (ACLU), and the National Center for Lesbian Rights (NCLR). “At the time, I didn’t think of myself as taking on a big endeavor,” Denee says of spearheading this advocacy with CMS. “I just ran out of options.”GLAD, ACLU and NCLR collaboratively sought review of the reasonableness of the existing exclusion, which was based, in part, on some very old and questionable science dating back to 1981, as well as on prejudice and misunderstanding about transgender people’s lives. That word “reasonableness” is the legal standard by which CMS must justify exclusions from Medicare coverage, such as the exclusion found in the “transsexual surgery” national coverage determination (NCD). The organizations submitted key studies and expert affidavits demonstrating that gender affirmation surgery is effective and essential medical care. On May 30, the Department Appeals Board of the Department of Health and Human Services, an independent reviewing body, issued a decision that the Medicare exclusion is not valid under the standard of reasonableness. There was still work to be done following the Department Appeals Board decision, however, before Denee could finally schedule her surgery. When her primary care physician submitted a surgery pre-authorization, her care group, Presbyterian Senior Care, still turned it down. But this time, a call to CMS resulted in a directive that the procedure should be covered. That person is a woman very involved in her community. President of her local Veterans for Equal Rights chapter, she proudly marches each year in the Albuquerque Veterans Day Parade. And she volunteers with her local transgender center, particularly with transgender youth, who she sees as fortunately having more options open to them than she did as a child.